FastDXT is fast implementation of a DXT compressor, giving you real-time compression speed for HD and 4K content. It uses a smart algorithm and an implementation with multimedia instrutions (SSE2). It offers a fully optmized DXT1 code, a partially optimized DXT5 code, and finally a partially optimized DXT5 using the YCoCg colorspace code. The DXT5-YCoCg code gives a reduced error at the expense of a smaller compression factor (6 vs 3). The code is also multi-threaded (for now, 1,2, or 4 threads for single, dual, or quad-core CPUs). Check wikipedia to understand how DXT works. The source code is made available under the terms of the GNU General Public License. Building this source requires a compiler working with SSE2 intrinsics and the following libraries: SDL, GLEW (for display only). A makefile is included for Unix systems (Linux and OS X). A Visual Studio 2005 project file is included for Windows. Acces to the Subversion repository might be provided in the future. By default the code uses SSE2 intrinsics to get the fatest speed (using DXT_INTR #define). For a C-only implementation, remove the #define in the Makefile and/or dxt.h file. 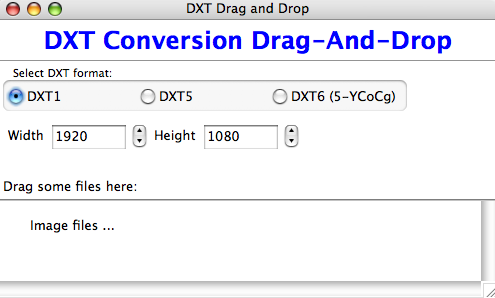 Drag-and-Drop conversion tool (written in Python and WxWidgets). FastDXT requires an OpenGL 2.0 implementation with the extensions GL_ARB_vertex_program, GL_ARB_fragment_program, and GL_ARB_texture_compression to display compressed DXT5+YCoCg textures correctly.